Who were the Tudors? The Royal Tudors family tree traces the rise and the fall of the Plantagenet dynasty and the start of the Tudors dynasty with Owen Tudor. The Tudor family tree ends with Elizabeth I. Queen Elizabeth I died childless, thus ending the famous dynasty of the Tudors, and she was succeeded by King James I (1603–1625) and the dynasty of the Stuarts. Who did the Tudors marry? The six wives of Henry VIII immediately spring to mind. Who were the children of the Tudors? And who were the close relatives of the Tudors? Full details of the Tudors and their family tree is available in this section. King Richard III was defeated by Henry Tudor at the Battle of Bosworth Field in 1485 which started the House of Tudor. It is interesting to note that Edmund Tudor married Margaret Beaufort who was a descendent of John of Gaunt and Katherine Swynford. The Tudor Family Tree and the House of Tudor started with the defeat of the last Plantagenet, King Richard III, at the Battle of Bosworth Field when he was defeated by Henry Tudor who became King Henry VII, the father of King Henry VIII who was the most famous Tudor King. The Tudor family tree then continued with his children: Edward VI, Bloody Mary and Queen Elizabeth I. 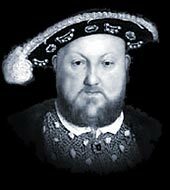 The Tudor Dynasty and Family tree then ends as all of the children of King Henry VIII were childless. The next English royal dynasty were the Stuarts who started with James I who was the son of Mary Queen of Scots, the cousin of Queen Elizabeth I. Each section of this Tudors website addresses all topics and provides interesting facts and information about the Tudor Family Tree. The Sitemap provides full details of all of the information and facts provided about the fascinating subject of the Tudors!